US 29 north to 3rd Reidsville Exit #153 (US158 and NC14) Follow NC 14 north 9 mile to Eden. Continue through the stop lights and take the Meadow Road exit. Turn left (west) on Meadow Road. 1 mile to stop light. Go straight and across the Smith River bridge into the traffic circle. We are at the traffic circle on the right. US 158 east through Stokesdale to US 220 north. Go north to the NC 135 exit. 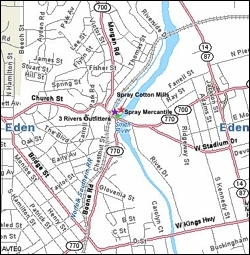 Turn right (east) on NC 135 towards Eden. Follow NC 135 about 9 miles to traffic light. Shell station on left. Continue straight for about ½ mile to stop sign. Eden Drive In is straight ahead. Turn right (east) on Washington Street. Go 1 ½ miles through the business district. At the 7th light Scotties will be in front of you, video store ahead and on left. Go straight and a little left between Scotties and video store (Boone Road). Follow Boone Road to the traffic circle. We are at the traffic circle on the other side. We are located at the traffic circle on the right. Download and print a copy of Driving Directions at left for your convenience.